The Foundation opens today a new sustainable fashion store in Barcelona. It is located in Calle Calàbria, 33, in the middle of Sant Antoni neighborhood. 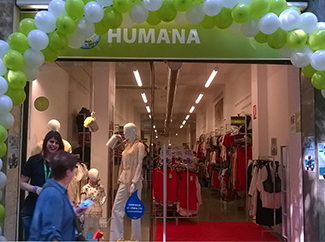 It has 200 square meters of surface, in which more than 5,000 women's, men's and children's garments are distributed, as well as accessories. It also includes the sections of sportswear, large sizes and signatures. With the opening in Calàbria, there are 43 stores in Spain: 18 in Barcelona, 21 in Madrid, 3 in Seville and 1 in Granada. Through it, the Foundation promotes sustainable fashion and reuse of textiles, giving a second life to used clothing. There is no more sustainable garment than the one already manufactured. The purchase of secondhand garments promotes circular economy and prolongs the life of clothing: it is the circular fashion.